If you played Call of Duty Black Ops II, you may recall this chap you can see above. His name is Manuel Noriega, and – unlike so many aspects of Call of Duty – he’s actually a real person. Quite a nasty one too; he’s currently sitting in a prison cell in Panama for crimes he committed during his reign as the country’s dictator. Murder ranks among his more awful crimes. He’s in the news today though not for committing any further atrocities from his jail cell, but because he’s attempting to sue Activision for portraying him in a negative light in Call of Duty. 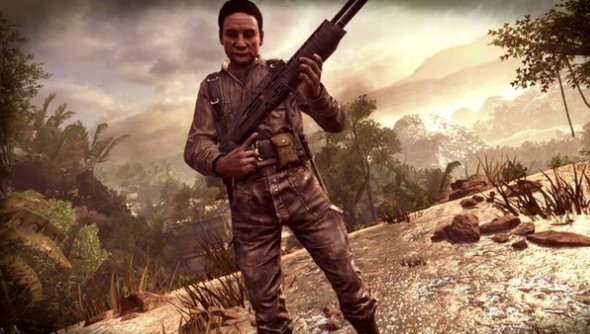 In Black Ops II, Noriega works as a CIA informant helping the player’s squad hunt down a Nicaraguan terrorist, only to later turn on the US and become the target of the game’s crack team of elite military soldier people. It’s not exactly the same story you’ll read in history books, but Noriega was indeed a CIA informant, and in 1989 President Bush did order a US invasion of Panama to disrupt his horrifically violent dictatorship and capture him. The 13-page document that makes up Noriega’s claim against Activision states that Black Ops II portrays him as a “kidnapper, murderer and enemy of the state” responsible for “numerous fictional crimes”. Also included is the accusation that use of Noriega as a character made Black Ops II more realistic, and thus more appealing to fans and helping boost sales. “Lost profits” among other things is the reason behind Noriega is suing Activision. It would seem that the lawsuit is being carried out on the basis of the Right to Publicity element of US law, which allows individuals to dictate how they are depicted in commerce. Of course, whilst Activision is a US company, Noriega is neither a US citizen or resident, which could well destroy any chance he has at a successful case. Do you think Noriega has any right to stipulate how his persona is used? Does Activision have any right to use a fictionalised (if more-or-less accurate) portrayal of a real person? Sound off in the comments.